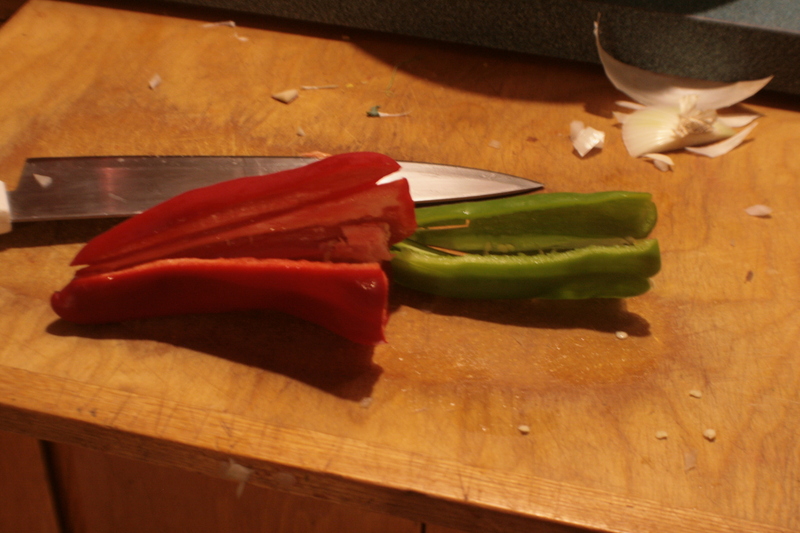 Saturday night, my kitchen was a study in the culinary consequences of Imperialism. I started with a recipe out of the same Latin American cook book the empanada pie came from. 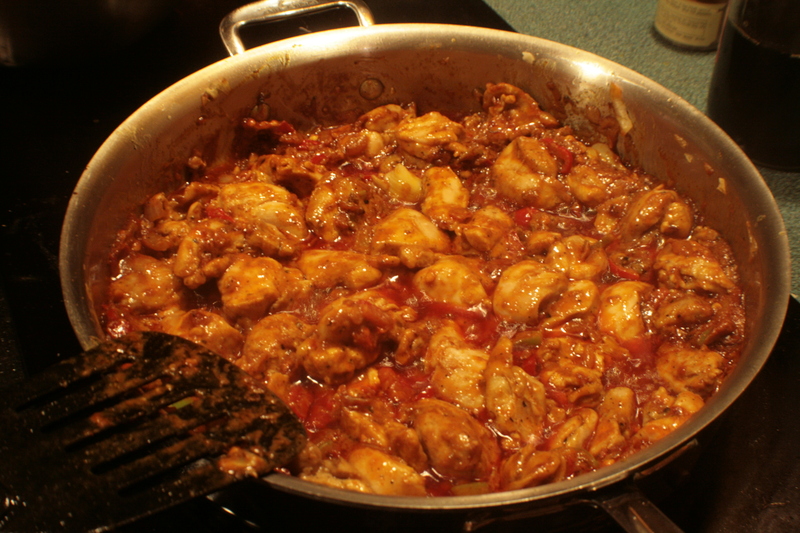 This recipe was from Brazil, and is described as having been an African dish adapted to local ingredients. Looked good to me. Though I did, of course, start almost immediatly with ignoring the directions, breaking out a package of boneless thighs rather than cutting up a whole chicken. 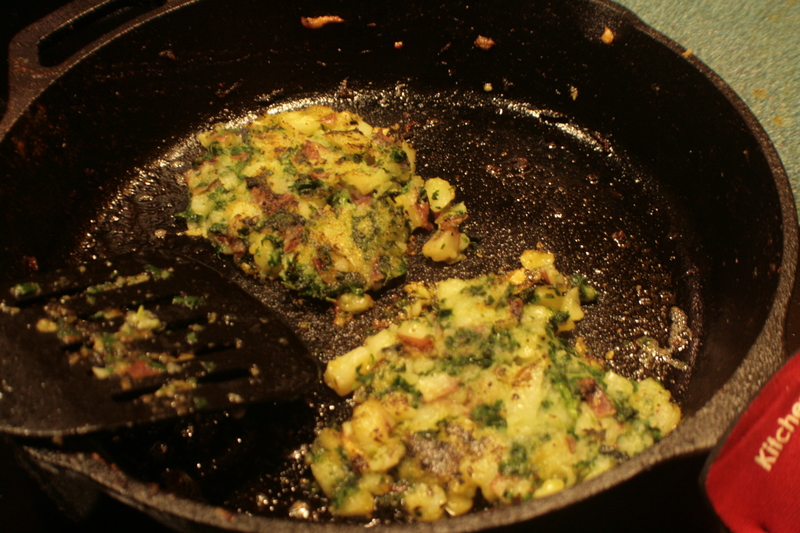 In addition to the chicken thing, I pulled a recipe off our CSA’s site for kale potato pancakes. We have a lot of kale, you see, and I was pretty sure we were going to need something starchy to go with dinner. The recipe claimed it made six servings, and since I was feeding two people I halved the recipe. 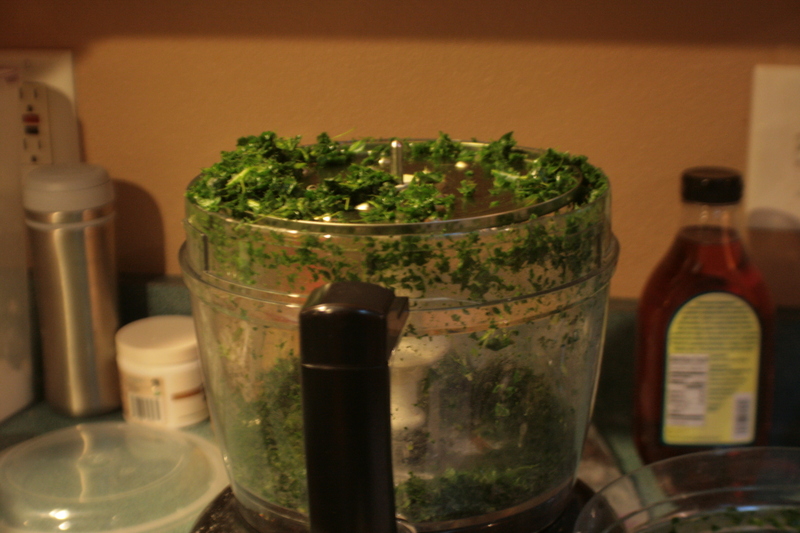 It also said to finely shred the kale. 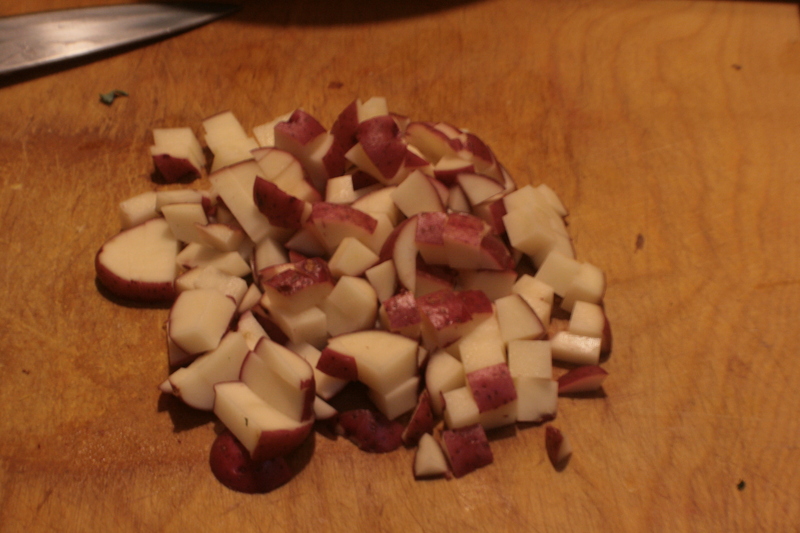 I was feeling lazy, so I experimented with using the food processor to shred. I suspect the configuration you see is not how it’s meant to work, but my kale wound up shredded, so if I did it wrong, oh well. Those potatoes are so getting boiled! And then fried! Back to the chicken. 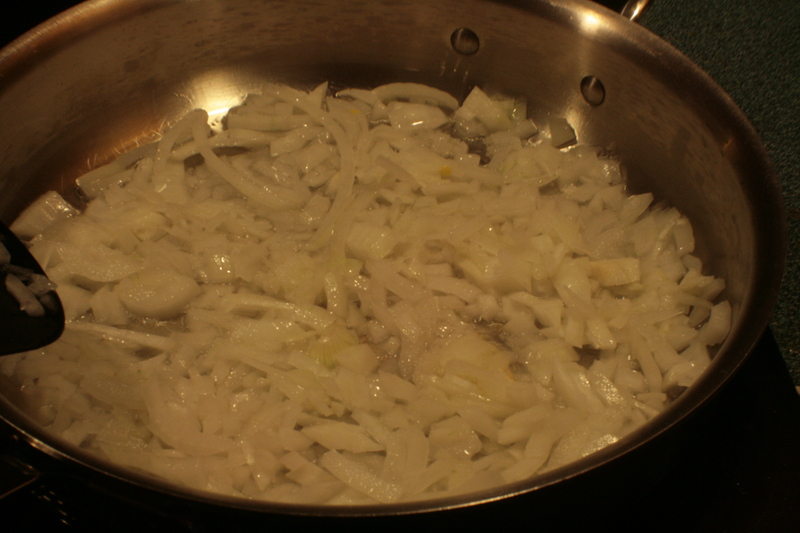 First step: cook onion. The recipe called for a whole onion, but the only onion we have left from the CSA was HUGE, so I used half. That is half of that onion. The smaller half. 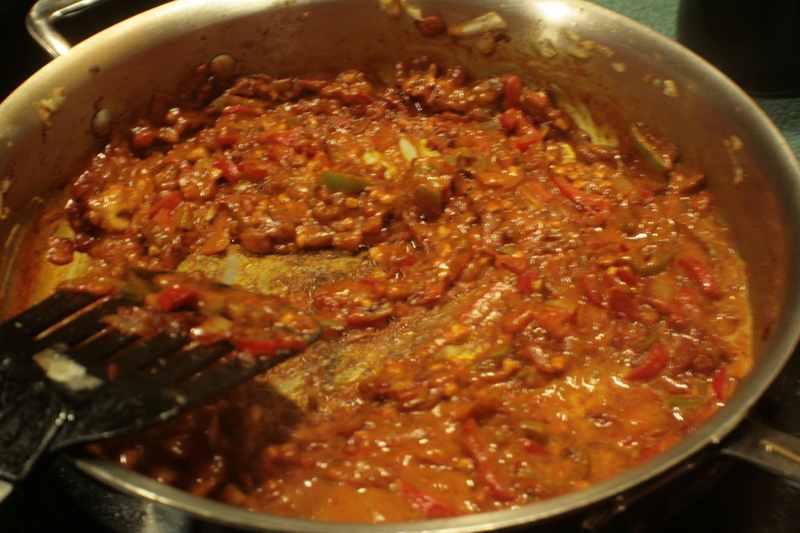 The recipe called for chilli peppers. I used what we had instead, which weren’t as spicy as what the recipe called for (as in, weren’t spicy at all) but I was way more interested in racking up points on the “Which veggies did you use” card than in being faithful to the recipe. 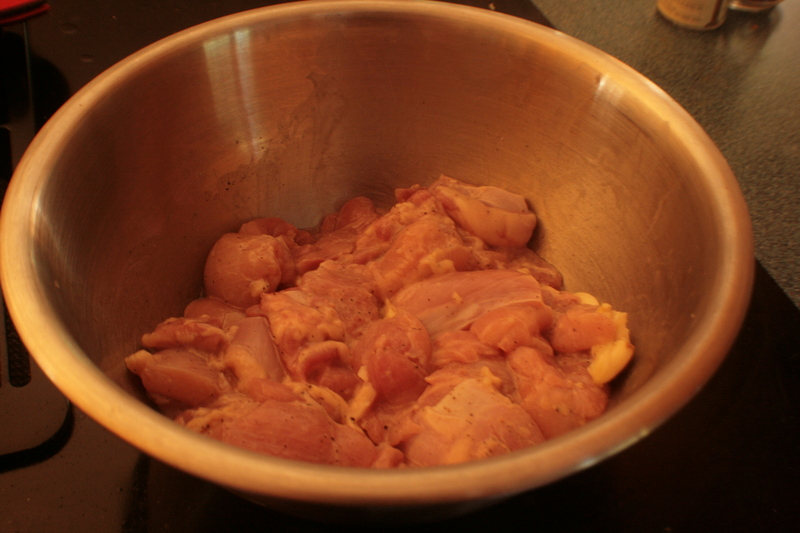 Meanwhile, sear the outsides of that chicken you’ve been marinading and get it all brown and tasty on the outside. 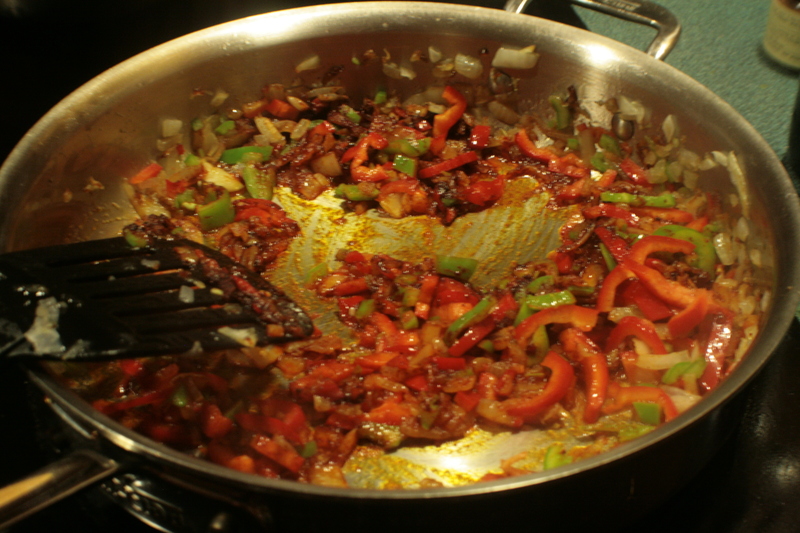 At this point I had three of four burners going on the stove. And I still managed to unload the dishwasher while cooking dinner. I’m very proud. 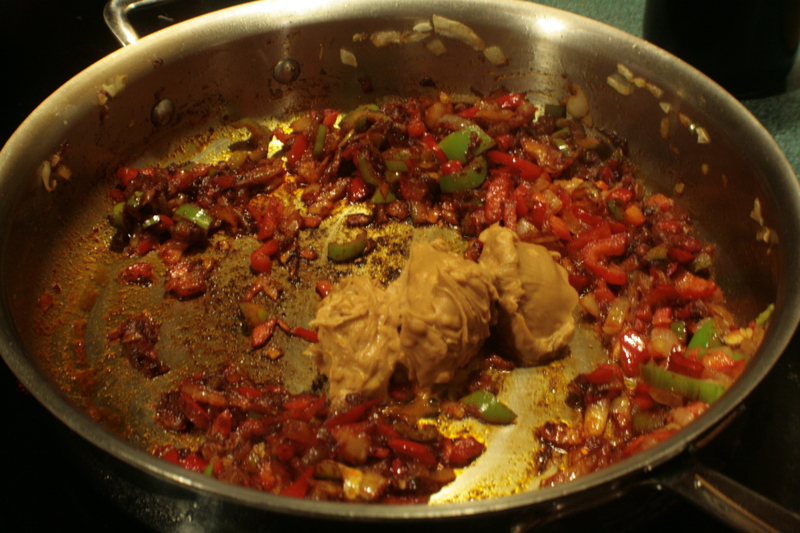 Yeah, that’s peanut butter I just mashed all the continents together in one skillet. Ladies and gentlemen, I give you globalism in a photo. This is where i got smugly excited about dinner. Because man, suddenly i have a skillet full of veggies cooking in peanut sauce. What’s tastier than peanut sauce? NOTHING. 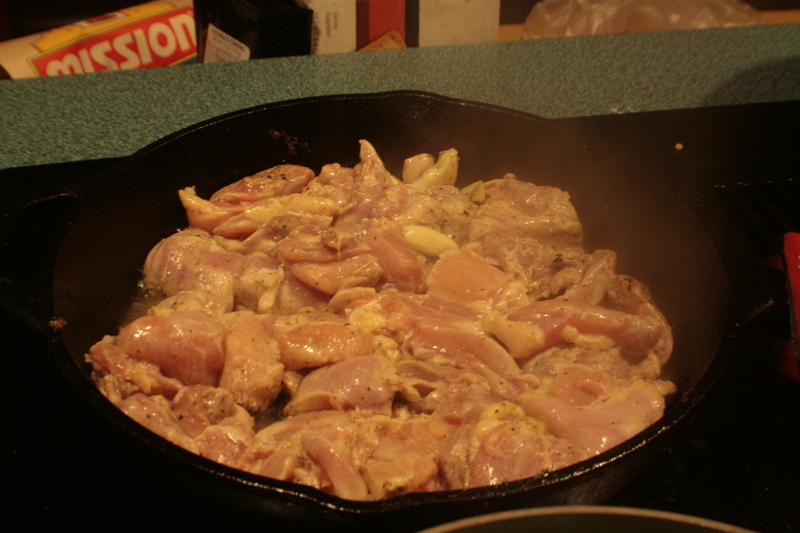 And then I dumped everything from the cast iron skillet full of chicken into the pan, swapped burners so that this one went on the back of the stove, and left it to simmer while I ignored it in favor of starchy things. I was skeptical about these pancakes pretty much from the moment that I noticed the recipe called for half an onion, but never actually told you to put the onion in the dish. I’ve been less than impressed across the board with the recipes provided by the CSA. They’re decent for blandish inspiration, but trying to actually follow them is going to lead to tragic disaster. They’re consistently wrong about proportions, timing, miss steps, and forget to season things. But did I mention that we have a lot of kale this week? I’m pleased with the chicken. Next time, I’d vote for more lime juice thrown in at the end, and not forgetting to toss in cilantro and parsley, but as Nick commented over dinner, “It’s hard to go wrong with peanut sauce.” The potato pancakes were bland – really could have used that onion it called for but didn’t include. I wound up throwing some hot sauce on them, which fixed them right up. 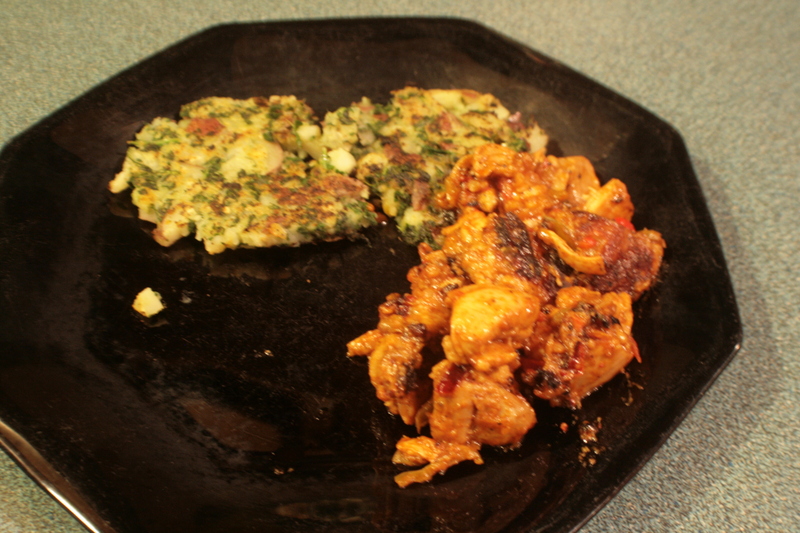 The kale did cook up nicely in them, though, so as a launching point to further experimentation, it wasn’t a bad start. Two peppers, half an onion, half a bunch of kale, and half a pound of potatoes. Veggie score: Awesome. This chicken has got a lot of stamps on its passport.